Bruce Willis is a genuine international movie-star. Personable and easy-going, he has been cast in a wide range of films, only to become pidgeonholed into headlining action movies. Willis was born to an American soldier stationed in Germany and his German-born wife, Marlene. When Bruce was two, the family relocated to Carney's Point Township, New Jersey. While in high school, Willis gravitated toward drama classes to overcome a stutter. After graduation, he worked as a security guard and private dtective — something which would come in handy later. Turning to acting, Bruce attended Montclair State University, but dropped out and headed for New York, where he worked as a bartender. His first screen credit was as an extra in Frank Sinatra's The First Deadly Sin (released in October, 1980). Moving to Los Angeles, Willis got a hefty guest role on Miami Vice, with his episode airing over NBC in November, 1984. He was chosen from over 3,000 actors to play David Addison, Jr. in 60 episodes of Moonlighting with Cybil Sheperd, from March, 1985 to May, 1989. The private detective show would win Willis an Emmy, and made the actor a worldwide celebrity. The first movie director to utilize Willis on the big screen was Blake Edwards, who cast him in the lead for Blind Date (released in March 1987). The film did well enough for Edwards to ask Willis to play Tom Mix in Sunset (released in April, 1988). It bombed. 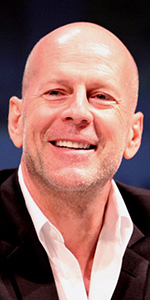 His turn in the action movie Die Hard (released in July, 1988), helped the film become a crossover hit, forever casting Willis as an action star — something he takes full advantage of, but he still finds time for other types of films — Bruce Willis likes to work. After doing the voice of the talking baby Mikey in Look Who's Talking (released in October, 1989), Willis went way out on a limb, starring in Die Hard 2 (released in July, 1990), scoring a bigger hit than the first film. He then was cast as the reporter Peter Fallow in The Bonfire of the Vanities (released in December, 1990). The film "underperformed," and led to the astounding flop Hundson Hawk (released in May, 1991). The Last Boy Scout (which played the Chinese in December, 1991), was another action film on the downward spiral, while the decidedly offbeat Death Becomes Her (released in July, 1992), didn't help. It was for director Quentin Taratino to cast Willis in Pulp Fiction (which played the Chinese in October, 1994); the film pulled Willis out of his slump, but Color of Night (released in August, 1994), was perhaps his biggest flop; the film is an "acquired taste." 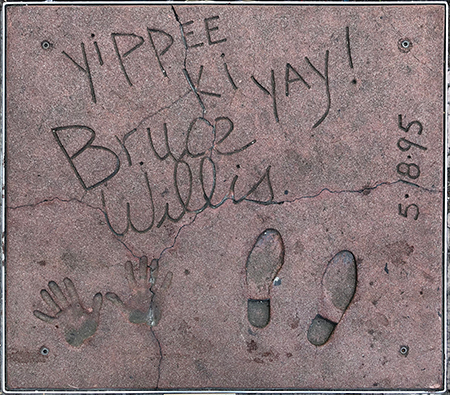 Willis was asked to stop by the Chinese for make his imprints to promote Die Hard with a Vengeance (which played the Chinese in May, 1995); the film lit up the box office all summer. Sci-fi and fantasy was Willis's next stop with 12 Monkeys (which played the Chinese in January, 1996), The Fifth Element (released in May, 1997), and Armageddon (released in July, 1998). While the film adaptation of Kurt Vonnegut's novel Breakfast of Champions (which had its premiere at the Berlin Film Festival in February, 1999), went nowhere, Willis delivered his biggest hit ever with director M. Night Shyamalan's The Sixth Sense (released in August 6, 1990). After appearing in the crime comedy The Whole Nine Yards (released in February, 2000), Willis teamed up with M. Night Shyamalan once more in Unbreakable (released in November, 2000). In the early 2000's Willis went on a binge of action films trying to be different: the caper film Bandits (released in October, 2001), the World War II drama Hart's War (released in February, 2002), and the Special Ops actioner Tears of the Sun (released in March, 2003). He played a hostage negotiator in a film called — surprise! — Hostage (released in March, 2005). These were followed by his turn in Sin City (released in April, 2005), which is now viewed as a classic, Lucky Number Slevin (released in April, 2006), which has become an underground favorite, and 16 Blocks (which played the Chinese in March, 2006). These were followed by the fourth installment of the Die Hard series Live Free or Die Hard (released in June, 2007), which is the fifth biggest grossing film in Willis's career. After Kevin Smith's comedy Cop Out (released in February, 2010), and another Special Ops film RED (released in October, 2010), Willis agreed to headline in director Wes Anderson's Moonrise Kingdom (released in June, 2012). Back in action mode, Willis got into the cast of The Expendables 2 (released in August, 2012), did the fifth Die Hard film, A Good Day to Die Hard (released in February, 2013), then went into that zone of filmmaking where there is only one word for the title of the picture: Vice (released in January, 2015), Extraction (released in December, 2015), Marauders (released in July, 2016), and he did a walk-on in M. Night Shyamalan's Split (released in January, 2017). His remake of Death Wish (released in March, 2018), has not fared especially well. Mann's Chinese Theatre, Hollywood, California. Bruce Willis Forecourt ceremony, Thursday, May 18, 1995. 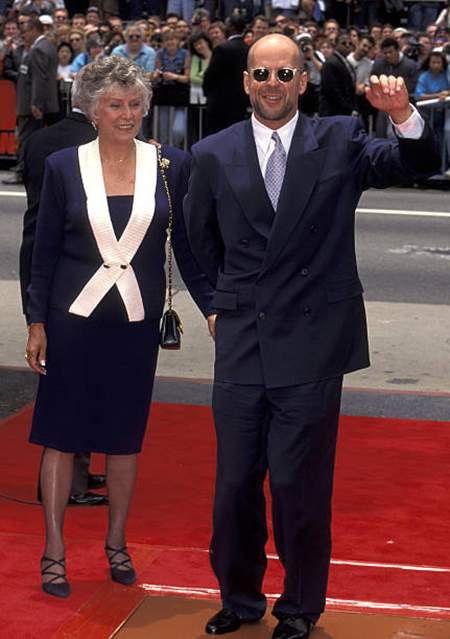 With his mother Marlene standing beside him, Bruce Willis waves to the cameras. Photo by Jim Smeal.